Over the years, the conversation about Africa has been shifting from one about shortfalls to one about opportunities. Africa is known as a leader in exporting of commodities, but the potential of the economy is far above that. There has been much progress over the years to make Africa a greater place than it is, but with the overall goal of making the region a competitive and effective player in international relations and the world economy, Africa still needs to find a way to deliver an effective, efficient and high-quality higher education systems in the region. It is quite obvious that access to early childhood education, primary and post primary education, which includes vocational education and training, remains a key challenge for the continent. For example, out of the 61 million children who are old enough to go to primary school are still out of school, 31 million of them (which is over than 50%) are found in the Sub-Saharan part of the African continent. Most of these children who are out of school are girls and children mostly from poor and remote rural areas and those affected by conflict and discrimination. In addition, the continuous use of child labor has exacerbated the problem and denied children their basic right to learn. Educational quality remains a serious challenge in Africa. Many countries in Africa continue to experience shortages of basic facilities, infrastructure, equipment and teaching and learning materials. For example, children continue to learn under trees, exposed to harsh and unbearable weather conditions and to struggle to learn without sufficient textbooks and reading materials. The unavailability of electricity, clean water, and sanitation facilities, which includes toilets for both girls and boys remains a key challenge, most especially in rural schools. For example, reports stated that at least 60 percent of schools have no toilets in Chad, Equatorial Guinea, Madagascar, Côte d’Ivoire and Niger. The general picture for education in Africa is one of ongoing progress and constant challenges. While no African country has achieved universal primary education, the number of children enrolled in primary school more than doubled between 1990 and 2012, according to “The State of Education in Africa Report 2015,” which was published by the Africa-America Institute. Yet in 2012, the average pupil-to-teacher ratio in primary school was 42 to 1, unchanged since 1999. In terms of higher education, enrollment more than doubled between 2000 and 2010 – with 50 percent more students per professor at African universities compared to the global average. Africa is the youngest continent, with 200 million young people between the ages of 15 and 24, the Africa-America Institute reports. By 2040, Africa will have the world’s youngest labor force. Young people in Africa need jobs and a positive outlook for their lives ahead. They need to realize their vision and to lead Africa forward. A quality education is a foundation and the essence of their future. With that being said, Non-governmental organizations have stood up in the different part of the African continent to contribute their own quota and make things right for the African child. Out of these organizations doing fantastically well is AFRICA EDUCATION AID FOR DEVELOPMENT NETWORK, a non for profit organization which is based in Lagos, Nigeria, West Africa. 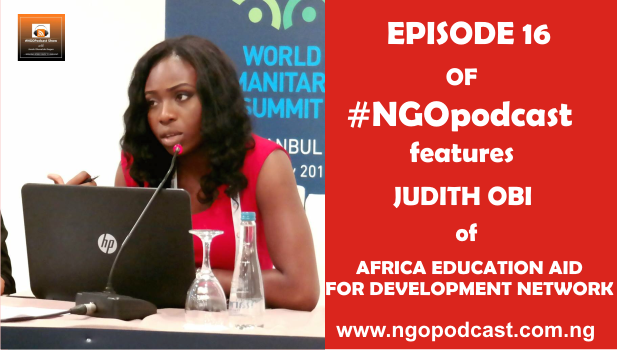 On this episode, I will be speaking with Judith Obi, the executive director of the organization, a young change maker and an amazing lady! She talks more about how her organization has been contributing their own quota to ensuring quality education for the African child.